Maysville: The Buckingham Hotel | slate river ramblings . . . . In 1969, the “Buckingham Court House Preservation Zone” was added to the National Register of Historic Places. It encompassed much of what was once called Maysville. Structures listed as part of the historic zone included: the Confederate monument, the former Buckingham Tavern, the former Buckingham Inn, the Leitch House, the Presbyterian manse, the Masonic Hall, Rose Terrace, and [Maysville] Presbyterian Church. A significant structure goes unnamed. Razed not long before, in about 1960, the Buckingham Hotel (a.k.a. The Moseley House) served the courthouse neighborhood for many years. 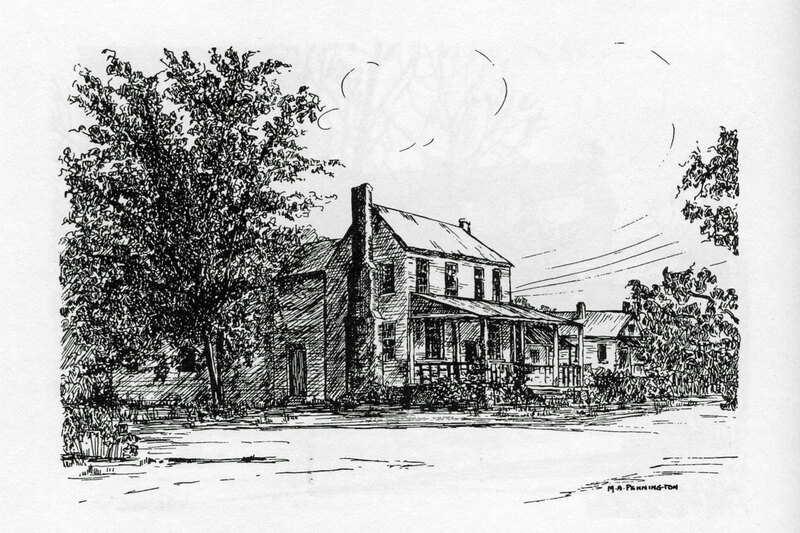 Built c. 1800, the hotel sat diagonally across Route 60 from the courthouse. In the early 20th century, it was believed to be the oldest house in the village. For those of you living outside of Buckingham County, a PDF of each month’s paper is always available at Fluvanna Review. Kimberly, I have not yet found a plat of Maysville, though one might be out there. I’m planning to post more about the earliest buildings. I’ll be sure to watch for information about William P. Shepherd. I always find info about buildings interesting. I think the building that is now Herbert Maxey’s law office (and which belonged to my great-great grandfather, Peter J Shepherd in the first half of the 20th C) is maybe one of, or the oldest houses in Bham Courthouse. It is out of the town a smidge to the east. Another “building” question I have is in the early part of the town. When B-ham Courthouse was incorporated, my fourth great-grandfather, William P Shepherd owned a lot in the city, for about six years (according to the state real estate tax records). Do you know if there exists a plat of the early village? I know the county records burned, but I thought maybe the state would have had a copy? Who would have allowed the incorporation? Boy, those records burning have made lots of stuff annoyingly difficult. Buckingham Hotels | slate river ramblings . . . .